When coaching individuals about living life with purpose and passion the topic of fear commonly comes up. Fear in simple terms is the lack of knowing. It is the brain running programs or beliefs that stop your advance as aggressively as a solid concrete wall. This false emotion appearing real is a fantasy played out in our minds, in fact most fear is simply a lesson waiting to be learned. There is an ancient story about a small village that had a dragon living in the mote. Every night the dragon came out to find food to eat. At first the dragon would get in the garbage for food and make a small mess to clean up. But in time the dragon was growing and its appetite was also growing. It started to get in the merchants food that was to be sold at the market. The dragon got so persistent that it started to even steal food when people were yelling at it. Well the village finally got fed up and decided to lock the dragon out over night but found that this simply made the dragon become more persistent tearing down houses and granaries for food. The villagers did not feel they should kill the dragon so it was decided to start feeding the dragon at the edge of the village. This solution at first seemed to work very well but in time the dragon needed more food that the little village could provide. In desperation the village set a trap to kill the dragon knowing if they failed the dragon would surly kill them all. As the village sat in fear and desperation waiting for the dragon to come eat so they could release the trap and end the siege the dragon had on the village. With a loud bang the trap was released and the dragon fell with a powerful thud. And the village yelled with joy. The village was so happy that it had a party the next day celebrating its freedom. The village had a feast that lasted all day long and as the sun set darkness overtook the village as the mother of the younger dragon showed up. This ancient story is one that lies in the heart of all of us. It is the fear that dwells in us that if we kill the dragon the mother of the dragon will show up. If you use brutal force to kill your fear then the fear will come back as a larger new lesson to learn. 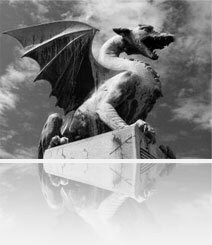 But those that look at the dragon as a lesson to learn, and not allow the dragon to maintain overwhelming devastation in their life they will ultimately conquer their fear. A client of mine had a large addiction towards Doritos corn chips and could eat several bags a day. She would even crumble the chips up in her hand so she could get more chips in her mouth at one time. After I shared with her the same dragon story I said lets feed the dragon and become friends enough to ask the dragon to leave us as a trusted friend. After a few days and 100’s of chips she got a glimmer of her dragon. She had gone through a devastating divorce and lost custody of her children in the divorce. She did not really understand how or why the whole thing took place and had been in mourning for the loss for over two years. But that did not explain the dragon, and how to finally learn the lesson of letting go of the pain of the past. Well as she looked deeply in the dragons eyes she saw a part of herself that wanted to get her family back – including her x-husband. But at a conscious level she knew that she did not have any feeling that she would ever in a million years want her husband back. But the dragon that lived below conscious was reliving times that seemed safe by eating Doritos. As time went by she totally lost her craving for the chip and took her lesson in stride. The dragon is a friend or foe; it is the teacher or the punisher. When you look fear in the eye and take on the lesson by feeding the dragon, you become the master of that fear waiting to grow into your total experience of life. Hey this was probably one of the best articles I have read on the topic so far. I don’t know where you get all your info but up! I am going to send some folks your way to read this. Fantastic, just plain amazing. I am have just started getting into writing articles myself, nothing compared to your writing potential (ha!) but I’d love for you to have a look at my work in progress someday! I love this article. It makes me realise that sometimes I don’t open door to opportunity when it knocks simply because I’m afraid of what’s behind the door. Seriously like the new design. I enjoyed this article. Appreciation for the excellent article.